I was asked in a blog comment today how I decide what to write about. And once decided, how do I go about doing it. In this case, the answer was easy, I decided to try to answer the question. And deconstruct the process I go through as it happens. Instructions: Read this post in black font first, then come back and look at the gray which deconstructs my thinking. Every story needs a starting point, I added the next paragraph in the second iteration of the post to create some context. And maybe to establish some kind of credentials and an authoritative tone. Why would you, the reader who does not know me, care how I answer this question. My goal was to show you that my answer to this question evolved, that it was not taught. And that I was surprised to find out I have been doing this for 10 years already. I started writing on the web in November 2004, see my embarrassing On opening a new Account. I had no idea what I would write about when I started, so I wrote about that lack of ideas. How meta. But I started. And I wrote. Views or opinions on topics related to my interests or work. Sharing something I have learned or done by write a reference post. Take on fun writing challenges on a topic I am not savvy with. But all my writing starts with an idea, a thought, an opinion or a challenge. Where do these come from? I realized after the second iteration of this post - I had focussed on the three kinds of post instead of ideas - that I had failed to answer the primary part of the question: How do I decide what to write about. So I added this section. Knowing the three areas I write about got my mind onto thinking where these magical topics come from. The answer, I jot down ideas. All the time. Over the years, I have become an inveterate note-taker. Having a blog and wanting to write means I need ideas. And since I have not yet figured out the voodoo behind when ideas strike or what triggers them, I jot them down as and when they do occur. I have notes with single phrases in them. I have notes with tweets that triggered thoughts. I have notes that look like half-completed treatises of a madman. I have notes that go nowhere. I have notes that contradict other notes. I have notes that repeat or reinforce other notes. I have notes to remind me to write about other notes. Whenever I come across thoughts, topics or ideas I could want to write about, I stop and take a note. A question, a tweet, another post, a sentence on a podcast, if they generate an idea, I stop and make a note. Then go back to what I was doing. The objective is to build a corpus of ideas irrespective of the quality of those ideas. Later on, the same day, weeks later, whenever, when I sit down to write, I look through these notes. Most get rejected. For example, there is no point in writing that I agree with someone else’s topic without having anything to add to it, even if it’s the most interesting topic in the world. And there is no point writing about stuff that no longer looks interesting to me sometime later, after the idea has cooled off a bit. Fortunately, I have enough of these notes that some remain after the great culling to work with. Which means I probably have something I could write about. But what do I want to say on that note’s topic? That’s where the categorization comes in. Do I want to express a view on it and add to the discussion? Is it something I have learned that I can share? Or is it a just writing exercise, a silly idea to help me become a better writer? I am sure you have guessed that this piece fits my categorization of a writing exercise. Can I think through and write about this topic, and actually get somewhere with it? We’ll both see. I had never thought through this before today. I try not to write and share my views if they add nothing to the larger conversation. So what does add to this conversation? Time to drill into it and see whether an opinionated idea can pass a sorting. If I have an idea to write about, I need to decide whether I can add to the conversation. No point in writing if it adds nothing. Once again, looking back, it seems that the sorting looks at three ways to determine if an opinion piece gets written. If I am unable to construct a story, argue a position or build a flow, the opinion piece fails the sorting and never gets done. I feel that it would not be interesting for me to write or you to read, as it adds nothing to the larger conversation. I noticed at this point that there are a lot of “I”’s in this post. I am standing on a soapbox talking about a self-invented process where I sort out ideas into ones I will argue and ones I will not argue. True. I was going to shorten this section but understood that its just one of three types of sorting I do, and topics rejected here may still have reference or challenge ideas in them. Reference, what have I learned? Many of my ideas come from what I do. I design and develop software. I enjoy new and exciting experiences and face new and exciting challenges in my sphere all the time. And when I find ways to do what I do better, I care to share. These are my reference topic ideas and they happen all the time as I solve new-to-me problems, try out new tools, or dive in where I have much to learn. Reference topics include how I go about common processes, or how I use software tools or how I think about business, software and design. They can be dry and factual. They can have screenshots and code and downloads to make them more visual and helpful. Reference topics cover the tools I use, the architectures I develop, the business topics I want to discuss. They also include product reviews, surprises I found, and new-to-me ways to do things. Why. Why do something that way? Why use that tool instead of another? Why think about a topic in this way? When. When should you apply this knowledge? When does it not work? How. How is this way or tool better? How does this process do better than others? I try to be clear in my reference topics. For example, I intensely dislike product reviews where the reviewer leaves the decision as to whether something is good or bad up to the reader. If a review talks about a product but does not have a why, when and how, then what’s the point of the review? Another example, a post on a data structure in computer science needs to explain why that data structure is good, when to use it and how is it better in that situation, else it too is useless. It’s a tough standard, but interesting is tough. Reference topic writing also helps me in other areas. Explaining complex software constructs or convoluted business processes is hard. Writing about them helps me find the words to express them simply and clearly. Reference posts to me are the easiest to write though. I know something I did not before, and I am sharing that knowledge or experience. The story is easy as it’s the journey I took to learn or experience that thing. And my opinions do not matter unless they add to the story. Facts do. The hard part is clarity, making complex topics readable, understandable and reproducible. Its all good to focus on the few skills that you are great at and let everything else slide. But writing about a few limited topics limits my scope and abilities. If I only wrote about tech, I’d get quite boring quickly. Thats where the fun ideas and challenges come in. In whatever you do, you should be stretching yourself. Whether that’s taking on bigger and more complex projects, changing industries, or building up new skills. If you are not learning or being challenged, you are stagnating. In writing, for me, that’s where I look for the challenges. I want to be a better writer. I have a long way to go, and many mentors high standards to target. But if I keep writing about what I know and have always written about, I will no longer be stretching, learning or growing. So I take on my own small writing challenges. I look through the strange and silly ideas I have had, and, instead of rejecting them because they are hard or different, I challenge myself to write about them. And, more importantly, I publish some of them too. The feedback loop on these is very important to self-improvement. Most of these exercises fail. If I cannot figure out most of the above, the story gets sorted out. But those that I can build even the weakest of stories and arguments on, I work on. The goal is to make me a better writer. And these challenges have certainly done so. I think my opinion pieces are better presented, and my reference pieces are clearer, all because I stretched myself in writing challenges. The hardest part was publishing them. I’m no expert on etiquette (See Email Etiquette) or suitcases (see Buying a New Suitcase) or personal story writing (see The Day He Walked to Freedom) or making fun (see Every ‘the Best Programmers Editor’ Review), but I took up the personal challenge, and then put them out there. Ironically, they were surprisingly well received. I did not want to talk about these challenges at first. They’re stupid exercises that I chose to do to see if I could become a better writer and have no place in a professional persona. But the reality is that they do work, and I seem to find myself being able to talk on a far wider set of topics than before, with greater comfort. It becomes a courage thing to write these challenges, and a courage thing to publish them. These exercises help me find newer ideas for topics to write about, and that is part of the answer to the original question. The sorting process helps me decide whether to write about the idea. It also forces me to think about what I want to say. It is at this stage that I find myself drilling into the idea, thinking about it in more detail and clarifying what I could write on it. It’s critically important to me to capture these thoughts, as I lose them later on. So I add them to the notes in point form. They are not fully thought out, just the random, unstructured fragments that come to mind while thinking about the idea. Later, I cannot understand half of what they mean. But at the time, it’s important to capture them. These are not structured thoughts. They are the scattered ideas of a scattered brain trying to think through an idea. They can be structured and reviewed later, but they need to be captured first. It’s not a formal process either. Brainstorming makes it sound like something you can learn and practice. Maybe you can, but for me its more like dumping a stream of disconnected consciousness into a note. This section was the one of the last to be written because I really struggled to find the words for it. How does one describe an informal brain dump where your creative and analytical juices are flowing and the result is almost incomprehensible. And yet without this messy pile of random thoughts, I really struggle to fill out the topic with reasonable and useful information when in the process of writing in clear sentences. So the idea has passed the culling and the sorting. In sorting I added many points I want to make to the note and now it’s time to write. Early in the piece, I also got stuck here when deciding what to write in this part of the post. I was thinking how sometimes the point you want to make just flows and there is no need to plan, structure, prepare to fill out or justify that part. And other times you get stuck, a part of the story needs to be told but you have no idea how to started on it. 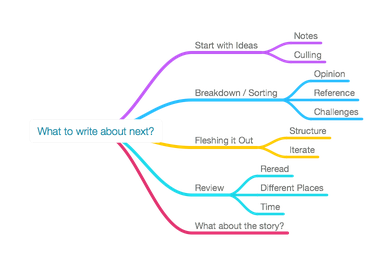 So I rely on a few tools, like mind maps, like asking myself why this part needs to be told, or try to document what I was thinking at the time, or even ramble on a bit to see if I get anywhere. Revisiting the structure and the why helps me think through the part again. And write it better. And that reminded me to write the previous section - where did I get the stuff to structure it in the first place? Some posts take minutes to write and they work. Other posts take months to think on and write on and never get finished. And a lot get rejected because they never get to any point. For bigger posts, I draw up a mind map using MindNode Pro. If there is a lot to write about, I feel it is important to list all the topics and structure the piece. It also helps me arrange thoughts and ideas. It helps me build the story. It helps me focus on the parts that I need to think about and and write. For smaller posts, I start with a point-form summary, or a document full of random sentences taken from my notes. No structure at all. And then I fill each section out with words and paragraphs. I try to type what I want to say, the way I say it. I just write. I do not worry about spelling, grammar, or even what I am writing. I just try to get it down and out as if I were on a stage in front of people having just been given an improv topic to talk about. Aside: I think I am one of the few people who do not mind being in front of a crowd with nothing prepared. I have not studied improv, but I did teach at university. And teaching makes you learn that you never know what questions a student will ask. So its best to be prepared, but better to be able to think on your feet. And that’s how I write at this part of the process. Of course, unlike public speaking, with writing I can iterate and fix it up later. Oh yes, that’s the next point. And then I iterate. Just like a programmer does. I reread what I wrote, correct the spelling and grammar. I look at the clarity, did I make the point? Does it flow? What did I miss? Am I repeating myself. This is not reviewing the topic, this is unit-testing, checking each sentence that I have written to see that it says what I wanted it to say, and reads that way. And most importantly, does the sentence add to the story, the argument, the topic, or do nothing with it. I digress a lot when I talk and think. These “thought bubbles” in this post are proof. But I do come back from digressions because my programmer mind brings me back to the original topic. I do not have a problem with digressions in writing, they usually add color to the story, but too many digressions and the reader will lose track. I try, not very successfully in my opinion, to limit these when I write by iterating and using the delete key frequently. I do not always succeed. I also get stuck a lot when writing. At the time of making the note, culling or sorting I had great ideas for the post, but now that I am in writing mode, I forget those great thoughts because I am focussed on making sensible sentences. That’s where the structure, the necessity of a point for sentences and the notes help. At some point, I find I have filled in all the sections. It’s time to go back and see if any of it makes sense. So I review the writing by re-reading it. The first few reviews are easy. The text is messy, it does not flow. Tones and tenses change. Ideas are still a bit jumbled. But now that the whole structure is filled it, it becomes easier to see where everything is, should be and how it should flow. It becomes easier to see where you repeat yourself, where you digressed, and where you lost the story’s plot. My early reviews involve re-reading in context, deleting that which is not necessary to the story, and filling in the smaller cracks that got missed out while focussed on writing. It also helps me see if the story works or not. Many a post has gotten this far only for me to realize that the story or points are either nonsense, boring or make another point entirely. So it’s more iteration, read, edit, write a bit more, re-read, re-edit, re-write. It is a sad truth, but rereading what you write again and again makes you blind to the text on the page. You start to miss the typos and grammar mistakes. Your eyes skip over paragraphs because you “just know” what’s in them. You assume what’s there instead of read what’s there. That’s why editors exist. But us lone writers do not have any. Reading the post aloud (or at least with my lips moving, like I was reading a speech). It helps to see if saying the words flows as expected, and just by saying things, they either feel right or wrong. Looking at it in a different context. I export to a drafts folder and view it in Marked.app or on the web. The simple trick of changing the look and location of the text undoes much of the reading blindness, helping me see how it works. Time heals all. While reviewing you get blinded. Come back later after doing something else when your mind has been elsewhere and the piece looks and feels different. That’s the best time to re-read and review it again. In reviewing this post, I realized that I had harped on a lot about telling a story. But had not yet explained why I think that. After I wrote this section, I noticed that it did not add anything new, every topic on writing pushes story over boring facts, and so I almost removed it. But I also felt the need to clearly point out that posts need to be interesting and the best way I know to make things interesting is to, wait for it, OK, you guessed it, tell a story. A good post needs to be like a traditional story, it has a beginning, a middle and an end. A great story comes full circle, where the end circles back to the beginning. For reference pieces, this is easy. The beginning is the problem definition, the middle is detailing the workings of the solution, and the end explains how the solution solves the problem. Full circle. For opinion pieces, not so easy. The beginning needs to set the stage. Why do I have this view, opinion or position? What is going on that this opinion piece needs to be written? The body then needs to walk the reader through the argument or story. Take them from the pre-set stage, through your thinking to the points you want to make. The road may be straight - a simple story, an easy post - to quite wiggly - complex ideas, digressions, a difficult post. And you need an end. You need to bring the story to a close, to show how and why the opinion or view impacts on the stage and how and why it is to be viewed differently after reading the piece. It’s not a case of being right, it’s a case of presenting your thoughts, ideas and experiences, applying them and helping the reader see what you see. For the writing challenges, it’s even harder. There may be no beginning other than the challenge itself - like this piece. The body may be a mind game, a list of dry facts, a made-up story, or a well-written dissertation. And the end is your new-found view or understanding. You then need to make that interesting. And that’s where a story overlay kicks in. For challenges, I try to put myself into the challenge. How did I get to this challenge, how did think about it, what did I learn, and how did my understanding of the topic improve. The end may be a good piece or a mess, but at least I learned something, and maybe the reader can too. Either way, a story is the most common way we share information, its the most common way we remember information and its the most fun way to consume information. I don’t remember the Newtonian formulae for gravity, but I do remember the apple-falling-from-a-tree story. For a post, a presentation, a speech to be interesting, it needs to couch the information it contains in a story. If that’s all you take-away from this piece, that’s good enough for me. It’s time to end this story. Way too many words have been written already. And I think I have covered how I capture ideas, decide what to write and what I then do with it. Which means I have answered the question. Time to close the circle. When I started writing, I worried about what would I write about, just like the individual asking the question. I did not know who my audience would be, and whether I should write for them or for me. I did not know my own voice. So I followed some good advice and just wrote for me. Initially the topics were quite random, a lot more writing challenge style posts. But I did start jotting down all my mad ideas. As time progressed, I found myself writing more and more opinion and reference pieces. I still had no audience or voice. And then one day, I noticed that I did indeed have one. This one. And immediately set out to challenge myself to write better for me and my audience. I get ideas from what I do, see, read and hear. I write about what I am interested in, where I feel I can add to the conversation and hope that you, the reader, finds some of it useful. I write in the form of a story where possible, as its the easiest to consume and remember. But almost all of my writings all started as ideas in notes. They survived the culling and the sorting. They grew as I thought more deeply on the idea. They got written and reviewed and iterated on. Where possible, they told a story. Some were good, some not so much. But I intend to keep on doing it. Now, what to write about next? Let’s look in the ideas folder again.